Located under the authority of the Department of the Navy, the U.S. Marine Corps (USMC) serves as a land and air “force in readiness.” Since the late 19th century, Marines have been used by the U.S. government to execute foreign policy objectives and protect American interests overseas. USMC forces have been at the center of major wars and key military operations, garnering them a reputation as an elite fighting force. Like the Navy, the U.S. Marine Corps can trace its origins to before the United States was founded. On November 10, 1775, the Second Continental Congress passed a resolution creating two battalions of Marines for service as landing forces with the newly established fleet. Serving on land and at sea, Continental Marines conducted several military operations during the Revolutionary War, including their first amphibious raid into the Bahamas in March 1776. The first commissioned officer in the Continental Marines was Samuel Nicholas, who served as the senior Marine officer throughout the American Revolution and is considered to be the first Marine Commandant. When the Treaty of Paris was signed in April 1783, the Revolutionary War came to a close. Fearing that a standing military might prove a threat to the new United States government, the Army, Navy, and Marines were disbanded. Lawmakers began to reconsider this decision not long afterward, as the lack of any military force on the high seas left American shipping vulnerable to seizure by pirates and European powers warring with one another. In 1798 the Marines were re-established as a standing military force and have remained so ever since. During the turn of the late 1700s/early 1800s, Marines saw action in the quasi-war with France, landed in Santo Domingo and took part in multiple operations against the Barbary pirates in North Africa. It was this latter campaign upon which a legendary phrase of the Marine Corps anthem was based, the “Shores of Tripoli.” Marines also took part in numerous operations during the War of 1812, including the Battle of New Orleans. Although the United States was still a long ways from becoming a world power, the early 19th century saw the first attempts by the U.S. to protect its overseas interests. These attempts involved using the Marines as projections of power because of their original duty as combat soldiers aboard U.S. naval vessels. In the decades following the War of 1812, Marines were used to protect American interests in the Caribbean, the Falkland Islands, Sumatra, off the coast of West Africa and at home in operations against the Seminole Indians in Florida. During the Mexican-American War (1846-1848), Marines seized enemy seaports along the Gulf of Mexico and the Pacific coast of Mexico. A battalion of Marines fought with Army General Winfield Scott’s army at Pueblo and fought all the way to Mexico City, referred to as the “Halls of Montezuma” in the USMC anthem. Military actions of the Civil War were mostly fought by the Army. However, Marines did participate in a few battles, including Bull Run. Most actions came as part of efforts by Union naval forces to blockade Confederate ports. Marines participated in missions at Cape Hatteras, New Orleans, Charleston, and Fort Fisher. It would be almost 40 years before the Marines participated in another war. But that conflict, the Spanish-American War (1898), proved momentous for the Corps. The sinking of the USS Maine, which provoked the outbreak of war with Spain, prompted many young men to enlist in the Marines to fight on behalf of the country. This included a sixteen-year-old Quaker named Smedley Darlington Butler, who would go on to become one of the most famous generals and most decorated Marines in USMC history. Butler lied about his age in order to be commissioned as a lieutenant and serve in key campaigns in Cuba and the Philippines during the war, which also saw Marines fighting in Puerto Rico and Guam. From this point on, the Marine Corps became a key component of American “gunboat diplomacy” that was used increasingly to fulfill foreign policy ambitions. The invasion of the Philippines ultimately led to the islands becoming a de facto colony of America’s until after World War II. During the Boxer Rebellion in China (1900), Marines, including Butler, helped put down the uprising against Western countries that opened up China to foreign trade, and included the importation of opium and an influx of Christian missionaries who had come to convert the Chinese. Butler was wounded twice during fighting against the Boxers (Tihetuan) and would have been awarded the Medal of Honor for rescuing a wounded officer had it not been for a provision that made officers ineligible for the medal. This provision was later changed, and Butler went on to receive the Medal of Honor twice for heroics in other campaigns, making him one of only three Marines in USMC history to receive such distinction. Butler quickly moved through the ranks of the Corps as he continued to impress his superiors with his leadership in campaigns involving Central American countries. At the beginning of the 20th century, the United States began exerting its power and influence throughout Central America. Again, the Marines were called upon to enforce American economic and political interests in the region. Seemingly, wherever the Corps was at key moments, so was Butler, who served with distinction in operations in Nicaragua, Panama, Honduras, Mexico, and Haiti, where he won his second Medal of Honor and organized the Haitian police force. Like the Army, the Marine Corps saw limited action in World War I due to the late entry of the United States into the conflict. Marine units nevertheless distinguished themselves on the battlefields of France, especially the 4th Marine Brigade, which became known as the “Devil Dogs” after seeing action during 1918 at Belleau Wood, Soissons, St. Michiel, Blanc Mont, and in the final Meuse-Argonne offensive. By WWI the Marine Corps had also established the beginnings of an aviation section. Marine pilots flew bomber missions over France and Belgium. All in all, more than 30,000 Marines served in WWI and more than a third were killed or wounded in six months of intense fighting. Following the end of the war, some of the most noteworthy episodes for the Corps again involved Butler, who had risen to the rank of major general faster than any other officer in USMC history. In 1931, Butler publicly recounted gossip about Italian dictator Benito Mussolini in which Il Duce allegedly struck a child with his automobile in a hit-and-run accident. The Italian government was furious about Butler’s public recount and demanded of President Herbert Hoover that he do something about the outspoken general. Hoover, who wasn’t a fan of “Old Gimlet Eye,” instructed the Secretary of the Navy to court-martial Butler, who briefly wound up under arrest. Butler at first bristled at the idea of apologizing for his remarks, but later did and was given a reprimand instead of being court-martialed. He retired later that year after he was passed over for the position of commandant of the Marine Corps. Although out of the service, Butler was often asked to speak at events around the country. His heroics and frankness had won him a national following, and he frequently called upon the government to honor the bonus promised to WWI veterans, many of whom were unemployed and homeless as a result of the Depression. The reverence veterans had for Butler caught the attention of some Wall Street interests who approached the maverick former Marine about a scheme to force President Franklin Roosevelt, who had angered the country’s elite with his populist New Deal, out of power by leading an army of veterans on Washington D.C. The fantastic-sounding coup made headlines in 1934 after Butler went public about the plot and testified before a House committee investigating rumors that had been circulating Washington. Butler was labeled a quack in the press and quietly slipped from the public eye, although not before a publishing a book that renounced the United States’ imperialistic efforts involving the Marines. In War is a Racket, Butler called himself a “high class muscle man for Big Business, for Wall Street and the bankers” during his days commanding Marines in Central America and Asia. When World War II came along, the reputation of the Marine Corps reached new heights. Prior to the U.S. declaring war on Germany and Japan, the Corps began developing the doctrine, equipment and organization needed for amphibious warfare. This work paid off in the Pacific, where American military commanders set off on an “island hopping” strategy against Japanese forces. Marines established a reputation for tenacity and success in combat on Guadalcanal, Bougainville, Tarawa, New Britain, Kwajalein, Eniwetok, Saipan, Guam, Tinian, Peleliu, Iwo Jima, and Okinawa. Marines became famous not only for their heroics on land but in the air, thanks to the dog-fighting exploits of the Black Sheep Squadron led by ace pilot Gregory “Pappy” Boyington. By the end of the war in 1945, the Marine Corps had suffered 87,000 killed or wounded, and 82 Marines were presented the Medal of Honor, many of them posthumously. In spite of its contributions to the success of the U.S. military during WWII, the Marine Corps suffered severe cutbacks after peace was declared. President Harry Truman disliked the Corps and saw it as little more than the Navy’s police force. From a high of almost 300,000 men, the Corps shrank to just over 27,000 and much of its landing craft and amphibious carriers were sold off, scrapped or transferred to the Army. This left the Corps in a weakened state when it was called upon by Army General Douglas MacArthur to help with the risky amphibious landing at Inchon, Korea, in 1950. The mission proved successful and Marines helped liberate Seoul from North Korean forces. Marines then advanced to the Chosin Reservoir in North Korea only to see the Chinese Communists enter the war, which ultimately became a stalemate after that. An armistice was declared in 1952, but the last Marine ground troops weren’t withdrawn until 1955. More than 25,000 Marines were killed or wounded during the Korean War. During the rest of the 1950s and into the 1960s, Marines were deployed numerous times as part of American strategic moves during the Cold War. In 1958 Marines landed in Lebanon to help bolster the pro-Western government that was confronted by a brewing civil war. During the Cuban Missile Crisis in October 1962, a large amphibious force of Marines was marshaled but not landed in Cuba. In April 1965, a brigade of Marines landed in the Dominican Republic as part of the U.S. invasion to keep the country from falling into allegedly Communist hands. But the Marine Corps’ largest and most important action during the Cold War came in Vietnam. The landing of the 9th Marine Expeditionary Brigade at Da Nang in 1965 marked the beginning of large-scale Marine involvement in the growing conflict. Instead of engaging in large-scale amphibious landings as in other wars, Marines frequently entered battle through a different means: helicopters. This resulted in the Corps expanding its aviation section to include greater numbers of rotary-wing aircraft, including the iconic Huey helicopter whose image became synonymous with the war. During the second half of the 1960s, Marines played key roles at battles such as Da Nang, Hué City, and Khe Sanh. The Marines operated in the northern I Corps regions of South Vietnam and fought both a constant guerrilla war against the Viet Cong and a conventional war against the North Vietnamese Army. Marines also implemented the Combined Action Program, a counterinsurgency warfare plan in which a squad of Marines would deploy at a village to work with locals on pacifying the area. By the summer 1968, after the Tet Offensive by North Vietnam, Marine Corps strength in country rose to a peak of approximately 85,000. The next year Marines began withdrawing, as the U.S. turned more to the South Vietnamese Army to fight the war. By 1971, the last Marine ground forces had left Vietnam, leaving behind only guards for the U.S. Embassy and other diplomatic posts. These Marine guards left in 1975 when the U.S. pulled out the last of its military and diplomatic personnel. More than 13,000 Marines died in the war, with another 88,000 wounded. Two months after the withdrawal from South Vietnam, a U.S. merchant ship, the SS Mayaguez, was captured off the coast of Cambodia by forces of the Khmer Rouge. President Gerald Ford ordered a detachment of Marines stationed on Okinawa to conduct a rescue operation. Little did the Marines know that upon landing by helicopter to seize the ship, the crew of the Mayaguez had already been released. The Marines wound up being pinned down by Khmer Rouge forces before they were evacuated. Fourteen Marines died during the fighting and another three were accidentally left behind and executed by the Khmer Rouge. Although it had nothing to do with the Vietnam War, the Mayaguez incident is considered by many as the last battle of that conflict. In fact, all of the names of the Marines who died in the attempted rescue were inscribed on the Vietnam Memorial in Washington D.C. Unfortunately for the Corps, the next major incident Marines were involved with proved even costlier. In August 1982, Marines once again landed in Lebanon, this time as part of a multi-national peace-keeping force sent by the U.S. and European powers to help stop the civil war that had ravaged the country since the 1970s. The following year, on October 23, a multi-story building at the Beirut International Airport that housed hundreds of Marines was blown up in a truck bombing that killed 220 Marines and 21 other U.S. service members. The incident proved a huge embarrassment for the administration of President Ronald Reagan, which subsequently withdrew the remainder of U.S. military personnel from Lebanon. Two days later, Marines participated in the invasion of Grenada, a tiny Caribbean country that had recently come under the control of a leftist government. Many observers saw the Grenada invasion as little more than a face-saving gesture on the part of the Reagan administration, coming so soon after the Beirut truck bombing. The administration justified the invasion by claiming America lives were at risk in Grenada. Whether they were or not, the military operation marked the continued use of Marines by the U.S. to exert political power over the Western Hemisphere. Six years later, American military forces, including Marines, launched Operation Just Cause to oust Manual Noriega from power in Panama. Less than a year later, in August 1990, the Iraqi invasion of Kuwait set in motion events that would lead to the largest movement of Marine Corps forces since World War II. Between August 1990 and January 1991, some 24 infantry battalions, 40 squadrons and more than 92,000 Marines deployed to the Persian Gulf as part of Operation Desert Shield, followed by Operation Desert Storm. The main attack to liberate Kuwait was led by the 1st and 2d Marine Divisions. In a little more than four days after the offensive began, almost the entire Iraqi Army in Kuwait had been encircled, with 4,000 tanks destroyed, by Marines and other coalition forces, effectively ending the conflict. The 1990s saw Marine deployments across a wide part of the globe, both for military and humanitarian operations. Non-combat missions took place in Liberia, Bangladesh, and the Philippines, among others. In Somalia, Marines spent two years participating in famine-relief operations and military missions to help stabilize the war-torn African country. Just as Marines pulled out of Somalia, others went ashore in September 1994 in Haiti as part of the U.S. force participating in Operation Restore (Uphold) Democracy to end the internal strife that gripped the small Caribbean country and to allow Jean-Bertrand Aristide to return to power. The remainder of the 1990s saw Marines deployed again to the African continent, including the Central African Republic, Zaire, and Eritrea to provide security and assist in the evacuation of American citizens during periods of political and civil instability in those nations. Humanitarian and disaster relief operations were also conducted by Marines in Kenya, Honduras, Nicaragua, El Salvador, and Guatemala. In 1999, Marine units deployed to Kosovo in support of Operation Allied Force, and following the 9/11 terrorist attacks, Marines were sent to the Arabian Sea and to southern Afghanistan. In 2003 the U.S. invasion of Iraq involved the largest deployment of Marine forces since the Persian Gulf War. Approximately 76,000 Marines deployed to the Central Command area for combat operations against Iraq. The I Marine Expeditionary Force (I MEF), including Task Force Tarawa and the United Kingdom’s 1st Armored Division, were the first conventional ground units to enter Iraq. Fixed-wing and helicopter aircraft from the 3d Marine Air Wing provided continuous close air support to Marine and other American and British units as they drove deeper into Iraq. On the ground, Marines from I MEF moved nearly 400 miles from the Kuwait border to Baghdad and Tikrit and eliminated the last organized resistance by Iraqi military forces. In early 2005, the II Marine Expeditionary Force replaced I MEF in Iraq as American forces concentrated on battling insurgents and other guerrilla fighters opposed to the United States’ military presence in Iraq. The Marines’ participation in the war officially ended on January 23, 2012. The number of Marine casualties in the conflict totaled 1,022, with 8,623 soldiers wounded. U.S. Marines were among the armed forces to enter Afghanistan in October 2001, taking on Al-Qaeda and Taliban forces as part of Operation Enduring Freedom in response to the September 11 terrorist attacks in the U.S. A third of the 30,000 additional troops sent to Afghanistan by President Barack Obama in 2009 were Marines, and 300 were killed in the war over a three-year period. There have been 19,400 Marines concentrated in Helmand province, and thousands are expected to return home in 2012 as part of the announced drawdown. The Marines’ participation in the war was not without controversy, as the United States’ role in Afghanistan came under fire when photos were released showing some Marines behaving abusively toward Afghan corpses. In 2011, the Marines were sent into Libya in support of Operation Odyssey Dawn, the mission being to prevent the forces of Muammar Gaddafi from launching airstrikes against the Libyan rebels. The Marines participated in the enforcement of the no-fly zone and airstrikes against Gaddafi’s troops. That same year, Marines stationed in Okinawa provided support to Japanese citizens displaced by the disaster caused by the 9.0 earthquake and subsequent tsunami. Located under the authority of the Department of the Navy, the U.S. Marine Corps serves as a land and air “force in readiness” capable of supporting U.S. military operations and executing national political objectives. Deploying for combat as combined-arms air-ground task forces (MAGTFs), the Marine Corps consists of both ground units that function similarly to Army units and air units that include both rotary- and fixed-wing aircraft, like the Navy and Air Force. The Marine Corps is led by the Marine Commandants, each of whom is numbered to demonstrate the leadership’s lineage dating back to the first commandant in 1798. While the chain of command dictates that the Marine commandant report to the Secretary of the Navy, Marine Corps forces can serve under the command of Army, Navy and Air Force commanders in charge of large-scale military commands. The structure of Marine Corps units is a blend of the structures employed by the Army, Navy and Air Force, due to the Corps’ ground and aviation capabilities. For ground forces, Marines units range from squads (smallest) to divisions (largest). For Marine pilots, the order from smallest to largest goes squadron-group-wing. Marine Corps wings are larger than their counterparts in the Navy, consisting of multiples types of aircraft, from F/18 fighters to attack aircraft to helicopters. Three major commands oversee all Marine units and air wings. Marine Forces Pacific (MARFORPAC), headquartered at Camp H. M. Smith in Hawaii, is the largest field command in the Marine Corps. MARFORPAC commands all Marine bases and stations on the West Coast of the United States and throughout the Pacific. MARFORPAC commands two-thirds of the Corps’ combat power and is responsible to two geographical U.S. unified military commands, Pacific and Central Command, and one sub-unified command in Korea. MARFORPAC has two major subordinate commands: First Marine Expeditionary Force (I MEF), headquartered at Camp Pendleton, California; and Third Marine Expeditionary Force (III MEF), headquartered on the island of Okinawa, Japan. Most of III MEF is in Japan. The commander of MARFORPAC also commands Marine Forces Central Command (MARCENT), also headquartered at Camp Smith, Hawaii. MARCENT supports American military operations in the Central Command Theater, which covers the Middle East and parts of Africa and southwest Asia. Among its many operations, MARCENT provides Marine units for U.S. missions in Afghanistan and Iraq. Marine Corps Forces South (MARFORSOUTH), headquartered in Miami, Florida, is the U.S. Marine Corps component of the U.S. Southern Command, responsible for Central and South America. The second major command is Marine Corps Forces Atlantic (MARFORLANT), headquartered at Naval Base Norfolk, Virginia. MARFORLANT is the Marine Corps component of the U.S. Joint Forces Command (USJFCOM), and it provides forces for operations in Europe and the Mediterranean. The warfighting arm of MARFORLANT is the II Marine Expeditionary Force (II MEF). 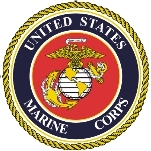 The third major command is Marine Forces Reserve (MARFORRES), located in New Orleans, Louisiana. Commanding all Marine Reservists located throughout the United States, approximately 104,000 personnel, MARFORRES has four major subordinate commands: the 4th Marine Division; 4th Marine Aircraft Wing; 4th Marine Logistics Group; and the Marine Corps Support Facility (headquarters battalion) in New Orleans. Marine Expeditionary Forces serve as the principle warfighting organization. The three MEFs—I MEF, II MEF, and III MEF—are located near major naval bases and airports, ensuring the rapid deployment of Marine combat power worldwide. Normally commanded by a lieutenant general, a MEF can include one or more divisions in its ground combat element, one or more aircraft wings in its air combat element and one or more force service support groups in its combat service support element. I MEF includes the 1st, 5th, 7th and 9th Marine Expeditionary Brigades and the 11th, 13th, and 15th Marine Expeditionary Units. II MEF includes the 3rd Marine Expeditionary Brigade, the 31st Marine Expeditionary Unit and Marine Ground Task Force 4. III MEF includes the 2nd and 4th Marine Expeditionary Brigades and the 22nd, 24th, and 26th Marine Expeditionary Unit. Established in October 1995, the Marine Corps Warfighting Laboratory conducts concept-based experiments to test new tactics, techniques, procedures and technologies designed to improve the combat capabilities of Marine forces. Included in its work is development of the Chemical and Biological Incident Response Force. The newest of the Special Operations forces, the US Marine Corps Forces Special Operations Command (MARSOC) was launched in October 2005 to form a unit of approximately 2,500 personnel. MARSOC consists of the 1st Marine Special Operations Battalion headquartered at Camp Pendleton, California, and the 2d Marine Special Operations Battalion at Camp Lejeune, North Carolina. Each is commanded by a Marine major and capable of conducting special reconnaissance, unconventional warfare, and counter terrorism, among other functions. MARSOC also contains the Marine Special Operations Support Group, which provides combined arms planning and coordination, K-9 support and communications support, and the Marine Special Operations School, which screens, recruits, trains, and assesses Marine Corps candidates for MARSOC. Weapons, equipment, and supplies used by the Marine Corps are provided through defense contractors. According to aeroweb, in FY 2012 the Department of Defense (as of June) had awarded contracts totaling $140.53 billion. However the top six companies, Lockheed Martin, Boeing, Northrop Grumman, General Dynamics, Raytheon, and Bell-Boeing Joint Project Office, received more than one third of that money. International Military and Government LLC (IMG) awarded $410,730,320 for delivery of 743 MRAP Category I vehicles. The Category I is an MRAP vehicle used by the Marine Corps and other Joint Forces for convoy operations. Stewart & Stevenson Tactical Vehicle, division of Armor Holdings, Sealy, Texas, awarded $481,835,008 for delivery of 1,024 MRAP Category II vehicles with CAT I seating configuration. BAE Systems Land & Armaments, LP, Ground Systems Division, York, Pennsylvania, awarded $234,043,500 for delivery of 393 MRAP Category II vehicles, along with three modified MRAPs, known as “variants,” for Marine Corps Special Operations forces and 51 MRAP ambulance variants. Force Protection Industries, Inc., Ladson, South Carolina, awarded $9,849,420 for delivery of 12 MRAP Category I vehicles and 6 MRAP Category II vehicles. The company was awarded a second contract for $7,690,529 for delivery of 11 MRAP Category III (Buffalo) vehicles. In addition to the MRAP, other equipment and weapons provided to the USMC include the M16, the primary assault rifle used by Marines since Vietnam, built by Colt, which also builds the M203 Grenade Launcher used by Marines. The main battle tank used by USMC armored units is the M1 Abrams, manufactured by General Dynamics. While defense contractors represent a critical support element for the Marine Corps, the USMC will no longer allow them to don Marine clothing, called “cammies,” in theaters of operation. For several years the Corps allowed contractors, technicians, and some government civilians to suit up and blend in with Marines in places like Iraq. Now, civilians are permitted to wear the Defense Department-issue three-color desert utility uniform. Some Marine Corps loyalists praised the announcement. Assistance with higher education costs is no longer available to members of the Marine Corps. In 2011, the Corps decided to slash tuition assistance by 80%, which reduced the maximum benefit from $4,500 a year to $875. The Marine Corps at the time was the smallest user of tuition-assistance benefits provided by the Defense Department, awarding only 9% of the total. Things got worse in 2013 following automatic budget cuts imposed on the Pentagon through sequestration. In March, the Corps completely canceled its tuition assistance program to save funding for other priorities. Education assistance had helped service members take college courses to prepare for military jobs or for work after their service. The MV-22 Osprey tilt-rotor aircraft stirred protests in Japan during 2012 as local residents objected to its deployment on the island of Okinawa. Having heard about the Osprey’s record of crashes, the Japanese were concerned about the safety of the MV-22 and the U.S. Marine Corps’ plans to replace aging helicopters with them. Twelve MV-22s arrived in Japan in October 2012 and were stationed at a Marine Corps air base on Okinawa, with another 12 on the way by summer of 2013, despite protests and demonstrations by thousands, as well as the threat by a local government official that the deployments of the aircraft could lead to a call for closure of military bases on Okinawa. Concerns over the Osprey’s safety grew worse once Japanese learned the Marine Corps planned to conduct training flights daily over six routes that covered most of mainland Japan. It didn’t help that two Marines had been killed in April 2012 in a training mission in Africa. Since coming online in the early 1990s, the Marine Corps’ V-22 Osprey aircraft has been accused of being a “widowmaker” due to the number of times it has crashed and killed military personnel. A series of fatal crashes took place between 1992 and 2000 involving the unique aircraft, which features rotors that tilt allowing it to take off and land like a helicopter but cruise like a plane. The accidents nearly got the V-22 program cancelled. But the Marine Corps and the aircraft’s manufacturers, Bell and Boeing, refused to give up and lobbied Congress to give it one more chance. So the service pulled the first generation of Ospreys, and Bell and Boeing worked on improving its design. After an 18-month redesign period, the Osprey returned to action in 2002. But the V-22 continued to have problems. In 2010, an Osprey used by the Air Force crashed in southern Afghanistan, killing four people on board. The incident prompted a military investigation, resulting in the probe’s leader, Brig. Gen. Don Harvel, concluding that engine failure may have caused the crash. The military did not like Harvel’s conclusion and overruled him, saying that the crew may have contributed to the crash. The general later said that his report got him into trouble with his superiors, causing him to retire earlier than planned. In 2012, there were at least two more crashes. An Air Force V-22 crashed during a routine training mission in Florida, injuring five crewmembers aboard. And a Marine Corps Osprey crashed during a training exercise in Morocco, killing two people aboard and injuring two others. Free Speech in the Marines? Sgt. Gary Stein, a 10-year veteran of the Marine Corps, was kicked out of the service in 2012 after he criticized President Barack Obama on Facebook. Stein first drew attention to himself two years earlier when he launched the Armed Forces Tea Party Facebook page. But it was remarks he posted using his personal Facebook account in 2012 that got him into trouble. Marine Corps officials warned Stein that his words could constitute a violation of the Uniform Code of Military Justice pertaining to disloyalty. He contended that he did not give up his right to free speech when he put on the uniform. After reviewing the matter, the Corps decided to give Stein an other-than-honorable discharge, which cost him most of his benefits. Stein appealed his discharge and later said he was sorry for his comments and apologized to Obama. During the election campaigns in 2012, the Marine Corps used his story to warn other Marines against using social media in that way. The year 2012 was particularly bad for the Marine Corps, in terms of public relations. One controversy arose after the media published a photo showing Marines in Afghanistan posing with body parts of dead Taliban fighters. If that wasn’t enough, a group of Marine snipers got into trouble for making a video that captured them urinating on the corpses of insurgents. Marine snipers also generated bad press that year when a 2010 photo emerged showing a team of sharpshooters posing with a flag that carried a logo resembling the Nazi SS symbol. The Marines claimed the “SS” in their logo stood for Scout Sniper, and that there was no intention to associate themselves with the former Nazi military unit from World War II. But then the Marine snipers created a new logo featuring what appeared to be a burning cross and the letters KKK, which drew accusations of racism. Again, the Marines said the logo was not what critics claimed; instead, the designer of the new logo, Staff Sgt. Nick Harrison, declared that the cross was really the crosshairs of a sniper scope and the letters represented the words “kill, kill, kill.” The officer who chose the design, Col. Harold Tyson, asserted that Harrison’s logo was the least offensive of all that were submitted. Defense Secretary Robert Gates angered those close to a fallen Marine after he refused to award him the Medal of Honor in 2008. Sergeant Rafael Peralta was recommended posthumously for the military’s highest honor after he died while fighting in Fallujah, Iraq, in 2004. Accounts by other Marines said Peralta, seriously wounded, sacrificed himself to save others in his unit by grabbing a live grenade and smothering it with his body. A panel appointed by Gates reviewed the stories about Peralta’s death and concluded there was some margin of doubt about what really happened. Instead of awarding Peralta the Medal of Honor, he was given the Navy Cross, the service’s second-highest award for valor. The decision did not sit well with Peralta’s family and friends in the Corps who served with him. Four years after Gates’ decision, Navy Secretary Ray Mabus helped revive the matter by saying he favored giving Peralta the Medal of Honor. But the decision still rested with the defense secretary, who by that time was Leon Panetta. But Panetta said there were still too many questions regarding Peralta’s actions, and he refused to reverse Gates’ ruling. Following the confirmation of Chuck Hagel in 2013 as the new secretary of defense, lawmakers on Capitol Hill launched a new effort to get Peralta the Medal of Honor. In the meantime, at the urging of Congress, via a defense bill, a littoral combat ship was named for Peralta. The Marine Corps’ recruiting center in Berkeley, California, has been a lightning rod for antiwar, antimilitary and other protesters. In 2007, within a year of the Berkeley Marine Corps Recruiting Center’s opening, members of the group Code Pink began protesting outside the station to voice their opposition to the wars in Iraq and Afghanistan. Demonstrators showed up outside the recruiting center in 2012 to voice their solidarity for whistleblower Bradley Manning, the U.S. Army soldier who had stolen thousands of classified documents and turned them over to WikiLeaks. Manning was arrested and faced court-martial proceedings. The recruiting center again made the news in 2013 after it was revealed that a local Bank of America branch had hired an information management contractor, TEKSystems, to help bank officials keep tabs on nearby protestors by data mining social networking sites, blog postings, and social calendar/coordination sites on the Internet. A U.S. Marine who fell asleep at his post in Afghanistan later killed himself after being subjected to abuse by other troops. In April 2011, Lance Cpl. Harry Lew, a nephew of U.S. Representative Judy Chu (D-California), fell asleep while on watch in Afghanistan. Members of his unit discovered Lew’s mistake—the fourth such time—when they radioed him for assistance and he failed to respond. Two corporals, whose names were withheld from an official report, berated Lew and ordered him to perform exercises while wearing body armor for four hours. Lew’s abuse included having his legs stomped on while exercising, and being kicked and punched by one of the other Marines. Lew then shot himself less than an hour after the hazing stopped. Lance Cpl. Jacob D. Jacoby was brought up on assault charges, convicted and sentenced to 30 days in jail. He was also demoted in rank. Charges also were filed against Sgt. Benjamin E. Johns and Lance Cpl. Carlos Orozco III. In January 2012, Johns was cleared of the charges. Chu called that verdict a travesty. Orozco was found not guilty the following month. The suicide rate among members of the U.S. military steadily increased while the nation attempted to fight two wars simultaneously, placing considerable strain on troops. Like other branches of the service, the U.S. Marine Corps experienced a rise in suicides and suicide attempts. In 2007, 33 Marines committed suicide—a rate of 16.5 per 100,000 troops. The following year the total reached 41 Marines, or 16.8 per 100,000 troops. By 2012, there were 48 Marine suicides and more than 150 attempted suicides, despite efforts undertaken by the Corps to extend counseling services and other mental health assistance plans such as outreach programs. The U.S. Marine Corps added to its ongoing water-contamination controversy at Camp Lejeune by posting a pamphlet on the Internet that inaccurately portrayed the pollution problem at the North Carolina base. The 33-page document, which was also given to members of Congress, stated there were no conclusive results about the chemicals, including benzene, in Camp Lejeune’s water, and that further study wouldn’t prove any different. These remarks prompted the Agency for Toxic Substances and Disease Registry and three North Carolina legislators to call for the Marine Corps to take down the pamphlet from the Web. Only after months of delay did the Corps remove the document. But it promised to revise the information and make it public once again. It has been estimated that as many as a million people were exposed to water laced with benzene, trichloroethylene and tetrachloroethylene while working and living at Camp Lejeune from the 1950s to the mid-1980s. It was feared that people who were affected might not seek medical care because of the misleading pamphlet. In 2012, President Barack Obama signed legislation that extended medical care to service members and their families who suffered from ailments as a result of the Camp Lejeune contamination. Marine Corps leadership was criticized in 2011 for inconsistently enforcing a policy that prohibited troops from wearing bracelets that commemorated friends killed in action (KIA). The Marine Corps Times reported that some personnel in North Carolina, California and Japan were restricted from wearing the KIA bracelets, which were considered unauthorized jewelry. Nothing in regulations specifically bans them, and watches and some simple jewelry are allowed for women. POW/MIA bracelets had been worn in the past—but the wars in Afghanistan and Pakistan result in more Marines killed than captured or missing. But other units allowed Marines to use them, provoking complaints from many in the service. After the story broke about the crackdown against the bracelets, Commandant Gen. James Amos met with senior general officers. Amos was persuaded and declared that all Marines would be permitted to wear the bracelets to honor their deceased comrades. Commandant Gen. James Amos announced in October 2011 that Marines would no longer be allowed to wear their sleeves rolled up—a fashion statement that had differentiated them from the other branches of the military. The decision, which upset many Marines, came on the same day that Amos decided to allow troops to wear KIA bracelets (see controversy above), which brought smiles to others in the service. Many Marines stationed in the U.S. tended to roll up their sleeves (which had been allowed by uniform regulations), while those deployed to Afghanistan left theirs down, for safety reasons. The new sleeves policy was intended to establish uniformity across the service—a standardized “look” for all the Marines. The Military Association of Atheists and Freethinkers filed a formal protest in 2011 complaining about two large crosses positioned high above Camp Pendleton in San Diego, California. The group argued the crosses violated the constitution and should be taken down and that there are other ways to honor the fallen. The 13-foot crosses were placed by troops and their families in 2003 and 2011 on a ridge that’s about a 3,000-foot hike above Camp Horno on the base. The crosses, and makeshift memorials around them, honor those killed in the Iraq and Afghanistan wars. The Marine Corps was still pondering what to do with the crosses as of April 2012. The Marine Corps announced in 2011 that squad units would begin using the M27 Infantry Automatic Rifle (IAR) instead of the M249 Squad Automatic Weapon (SAW). After a longstanding internal debate, the Corps decided to sacrifice firepower (85 rounds per minute) for accuracy and ease by going with the IAR (with a rate of 40 rounds per minute or 28 rounds per minute when the temperature is over 100 degrees). Exaggerated Account Results in Medal? Dakota Meyer became the first living Marine to receive the Medal of Honor since the Vietnam War, but the 2011 decision became embroiled in controversy. Following the awarding of the nation’s highest military honor to Meyer, speculation arose that the Marine Corps exaggerated the accounts of Meyer’s valor in Afghanistan. According to the service, Meyer drove his vehicle into a firefight to save numerous other Marines as well as two-dozen Afghan soldiers. But McClatchy Newspapers reported that after reviewing official accounts of the battle, some of the actions attributed to Meyer were either untrue, unsubstantiated or exaggerated. The newspaper chain also said that the distortion of the events was probably unnecessary, because there was plenty of truth to the story to merit awarding the Medal of Honor to Meyer. The Marine Corps unveiled a new recruiting commercial in 2008 that sought to attract more African Americans, but in the process provoked accusations of racism on the part of the service. Critics accused the Corps of reinforcing an old stereotype about black people and their inability to be good swimmers; it also harkened back to a controversy of the early 1990s, in which then-Commandant Gen. Carl Mundy Jr. told 60 Minutes that blacks performed poorly in swimming tests compared to whites. Following the decision in 2007 by the George W. Bush administration to send an additional 20,000 troops to Iraq to help stem attacks against American military forces, military experts began talking of another, smaller surge for ongoing military operations in Afghanistan. The conservative American Enterprise Institute, which was instrumental in designing the current surge strategy in Iraq, convened an “Afghanistan Planning Group” in January 2008 that was expected to announce recommendations for an influx of troops into Afghanistan. “It’s clear to everyone who looks at it that more troops are necessary in Afghanistan,” said Frederick Kagan, an AEI fellow and an architect of the surge strategy in Iraq. Already the U.S. has sent an additional 3,200 Marines into the country. Half of them serve as trainers, and the other half serve as combat troops backing up British troops in the violent, drug-producing Helmand province. On November 19, 2005, a squad of Marines was on patrol in the Iraqi town of Haditha when a roadside bomb exploded, killing one Marine. The explosion provoked a brutal response, according to witnesses and military prosecutors, in which Marines killed 24 Iraqi men, women, and children. News reports of the killings brought about condemnations of U.S. military operation in Iraq and reminded some of a similar episode during Vietnam at the village of My Lai (which involved Army soldiers, not Marines). Following an investigation by the military, eight Marines were arrested and faced courts-martial. By June 2008, cases against six defendants had been dropped, and a seventh was found not guilty. One of the defendants, Lance Corporal Stephen B. Tatum, initially faced charges of unpremeditated murder and negligent homicide, which later were downgraded to involuntary manslaughter, reckless endangerment and aggravated assault. Some Marines had told investigators that Tatum was among those who “cleared” two Iraqi houses, while another Marine testified Tatum told him to shoot a group of Iraqi women and children he found on a bed in a closed room. That Marine said he walked away but saw Tatum return and heard a loud noise, possibly gunfire or a grenade. USMC officials offered little explanation for why the charges against Tatum were dropped. Tatum’s attorney said his client had not struck a plea deal to testify against the remaining three Marines who were then awaiting trial. An eighth defendant, Staff Sgt. Frank Wuterich, also had charges of assault and manslaughter dropped and, in January 2012, was convicted of one count of negligent dereliction of duty, for which he received a cut in pay and reduction in rank. With no one sentenced to serve time in jail for the mass killings, outraged Iraqis have threatened to bring the case to the international courts. In 2005 the Marine Corps’ inspector general (IG) issued a report saying USMC units fighting in some of the most dangerous areas of Iraq didn’t have enough weapons, communications gear or properly outfitted vehicles. The report said an estimated 30,000 Marines in Iraq needed twice as many heavy machine guns, more fully protected armored vehicles and more communications equipment to operate in a region the size of Utah. The IG investigation also accused Marine Corps leadership of understating the needs of its units. One of the biggest concerns was a shortage of properly armored vehicles to protect Marines from roadside bombs, the single biggest killer of military personnel in Iraq. Three years later, the issue of insufficient armored vehicles arose again. In January 2008 allegations surfaced that the Marine Corps leadership had been slow to respond to requests for more protection for combat Marines. The allegations were made by Franz Gayl, a Corps civilian employee, who worked in the Plans, Policies and Operations Department of USMC Headquarters. Gayl wrote in a Jan. 22 report (pdf) that a 2005 request for new specially built vehicles, or MRAPs (Mine Resistant Ambush Protected), fell victim to the Corps’ “Byzantine” procurement system. He also alleged that USMC officials turned down the 2005 request for MRAP vehicles, in part because they were more concerned with budget constraints than they were with the safety of Marines. Based on statistics from iCasualties, Gayl’s report concluded that deaths from roadside bombs could have been reduced by 50% had the request for MRAPs been approved. Gayl’s assertions prompted the Marine Corps to ask the Defense Department Inspector General’s Office to look into the allegations. On March 31, 2004, four men working for Blackwater USA as security guards were ambushed by guerrilla fighters in the Iraqi town of Fallujah. The security contractors were killed, their bodies burned and mutilated, and two were strung up on a bridge over the Euphrates River. Images of the horror were broadcast around the world, and four days later Marine Corps units were ordered to invade the city and find the killers. The attack resulted in heavy fighting, and Marines left a few days later, only to return again to try and quell insurgent attacks. Marine Corps General James Conway, who would later assume command all of all USMC operations as commandant, was the top Marine officers in Western Iraq during the Fallujah attacks. Upon relinquishing his command of the First Marine Expeditionary Force for a new assignment, Conway criticized U.S. military and civilian superiors for first being overly aggressive in responding to the Blackwater killings and then vacillating by pulling out Marine Corps units so quickly. Conway said he had not wanted to mount an offensive against the town after the killing of the four guards. Conway also was critical of the decision to turn over Fallujah to a U.S.-trained Iraqi security force, known as the Fallujah Brigade. Not only did the brigade fail to combat militants, it actively aided them, surrendering weapons, vehicles, and radios to the insurgents, according to senior Marine officers. Some brigade members even participated in attacks on Marines ringing the city, the officers said. During their initial training after joining the Marine Corps, recruits enjoy a 10-day leave that allows them to go back home. But oftentimes recruits get into trouble while on this extended leave, costing the service money and in some cases ruining the recruits’ career before it has barely begun. Writing for the Marine Corps Gazette, 1st Lt. Daniel Durbin argued that the Corps should eliminate the 10-day leave for recruits. Durbin claimed in one year alone, the Corps had to kick 150 recruits out for reasons ranging from medical problems to disciplinary actions. With the Iraq war over and the conflict in Afghanistan winding down, the Marine Corps faced an uncertain future in terms of mission and resources. Pentagon budget cuts alone made Marine Corps officials and observers debate how the service should focus its preparedness for coming military operations. Maj. Peter Munson argued in the Marine Corps Gazette that the Corps should focus on several capabilities. These included the ability to quickly send aircraft and naval support facilities to multiple locations in the event of a conflict. As it turned out, Defense Secretary Robert Gates canceled the program, due, in part, to funding shortages facing the Pentagon. Should women serve in Marine combat units? In 1994, the Pentagon adopted a new policy, the Direct Ground Combat Definition and Assignment Rule, as the military eased other restrictions concerning women, such as allowing them to serve as fighter pilots. This policy remained in place for nearly two decades. But during the Obama administration, a new push began to allow women to serve in combat units, including those in the Marine Corps. In January 2013, Defense Secretary Leon Panetta lifted the ban, setting in motion the possibility that women would soon be serving in infantry, tank and special forces units. In a sign that the Corps was preparing to allow women in combat roles, the service developed new “functional fitness tests” used to gauge how soldiers perform in various combat tasks. The tests were said to be gender neutral and took the place of the earlier versions based on how men would perform. Supporters of putting women in combat units say the military has no choice these days but to embrace the new policy. With services finding it harder to fill their ranks and meet the needs of the nation, such as fighting two wars at the same time, the Pentagon has to realize that adding women to combat units could mean having more soldiers ready to fight. The reality is, that even if they haven’t been allowed in combat roles, some 150 women have been killed in Afghanistan and Iraq. And about 7 percent of the Corps is composed of women. Advocates also pointed out that new studies showed women were capable of withstanding the difficulties of combat. Research conducted by the Veterans Administration National Center for PTSD and Boston University School of Medicine showed women were as resilient as men in handling the stress of war. The conclusion refuted earlier assumptions that women were more vulnerable to trauma and more likely to suffer from more mental health problems as a result of exposure to combat. Despite new studies and arguments for allowing women to fight alongside men, some members of the military refused to accept such a change. Some argued, as they have in the past, that women simply “can’t hack it” in the field, meaning they can’t carry their own weight or be depended on when things get rough. Others said unit cohesion would suffer if women and men served together on the front. Retired Marine Commandant James Conway also questioned whether it was a good idea to let women fight. In fact, he insisted that most women don’t want to fight or have the policy changed. Should the Marine Corps be dismantled? Before stepping down as defense secretary, Robert Gates made some critical budget decisions during the Obama administration that not only impacted the Marine Corps’ future, but also raised questions about whether the service had a future. With billion-dollar budget cuts heading for the Pentagon, Gates decided to slash support for large, expensive programs that the Corps wanted. These included reducing the number of personnel by 15,000-20,000, canceling its plans for the Joint Strike Fighter, and even more importantly, killing the Marines’ new amphibious troop carrier, known as the Expeditionary Fighting Vehicle (EFV). This latter move really shook up Marine commanders and the service’s supporters. Amphibious operations have been at the core of the service’s mission since its creation, and by getting rid of the EFV, observers wondered how much standing the service had left in Washington—or what its usefulness would be the 21st century, with advances in precision long-distance weapons and the changing nature of warfare. But without the EFV, the question was raised how important the Marines would still be. “If the Marine Corps is no longer going to do opposed landing on enemy beaches in the face of hostile fire, then its role will be significantly diminished in the future,” Thompson added. Few people in Washington would publicly call for disbanding the Marine Corps. But privately many wondered how the service could continue to justify its place in the armed forces. Some critics have pointed out that even if the Marines still had their EFV, changes in warfare could render their ability to hit the beaches compromised, even if they were still necessary. These voices point to advances in land-to-land and air-to-sea missiles, which could cripple a Marine expeditionary force waiting offshore before it could deploy forces onto an enemy beachhead. Some in the U.S. Navy wouldn’t mind seeing the Marines take one on the chin, given their historical animosity toward one another. The Marines have always been part of the Navy, which has left Marine and Navy commanders fighting over the same defense budget. With the Marine Corps gone, the Navy would have more money to spend on its own ships and planes. The Marines publicly dismissed any talk of them becoming less relevant. Commanders argued that even in an era focused on combating terrorist cells, the Corps was proving its usefulness. “Since 9/11, U.S. amphibious forces have responded to crises and contingencies at least 50 times, a response rate more than double during the entire period of the Cold War,” Commandant James Amos said. Others, like retired Marine Gen. Chuck Krulak, argued that the ability of Marines to float offshore and quickly respond to crises—even if they never deploy—provided a U.S. president with political leverage when dealing with hostile nations. Krulak added that this capability could never be replaced by the Air Force or high-tech weaponry possessed by other services. “A B-2 bomber flying at 60,000 feet is not present, it’s nothing more than contrails in the skies,” Krulak said. Defense analyst Gordon Adams offered that the Marines are still a more agile fighting force than the Army, and it costs less because of its modest size. They can also do much more than storm beaches, including delivering humanitarian aid to people in need, which the Marines have often done, and training foreign militaries to fight insurgents, he said. I think it is disgusting that our Debt Ridden Government RULED by Obama would spend money to create a GENDER NEUTRAL UNIFORM. My Dad served in the FIRST MARINE DIVISION IN WORLD WAR II when MEN WERE MEN and Women were Women. This is an insult to the TRADITION OF THE MARINES. Obama wants to BELITTLE the MARINE CORP and ELIMINATE THEM since he doesn't see the need for them anymore just like he doesn't seem to see the need for all the GENERALS he has dismissed lately more than any other President! It is bad enough that he had two MARINES get married in the WHITE HOUSE! SIR, he is mocking the MARINE CORP and my Dad is FLIPPING IN HIS GRAVE!!! He was 100% disabled, loved the CORP and read us his OLD BREED GUADALCANAL BOOK Every evening when I was a child. He read the stories in the back of his brothers he said who did not come back and what they did! Our country is being run by a MARXIST/SOCIALIST President who would never QUALIFY to be a MARINE and I pity WOMEN who want to be MEN!! GOD HELP THEM! SEMPER FIDELIS! i volunteer to go to north korea and destroy thier atomic weapons nuclear plants. One of the earlier Marine Corps Commandants said after he had retired that he spent his whole career invading foreign shores "to protect the interests of Wall Street." Please let me know who this was and the exact quaote. Lt. Gen. Robert Neller officially took over the post of commandant of the U.S. Marine Corps on Sept. 24 when Gen. Joseph Dunford vacated the position to become President Barack Obama’s top military officer at the Department of Defense. Neller is from East Lansing, Michigan, and graduated from East Lansing High School in 1971. He went on to the University of Virginia, where he was a member of Theta Chi fraternity and graduated from Virginia in 1975 with a degree in history and speech communication. He later earned a master’s degree from Pepperdine University in human resources management. After graduating from Virginia, Neller went directly into the Marine Corps via the Platoon Leader Class. After his basic school, Neller was assigned to the Third Marine Division. In 1977 he was sent to the Marine Corps Recruit Depot in San Diego and by 1980 was promoted to captain. Later that year, he was transferred to the First Marine Division at Camp Pendleton. He worked there on testing of ARMVAL, an anti-tank program. After finishing that project, Neller was sent to Okinawa and returned in 1982 to attend the advanced armor officers’ course at Fort Knox, Kentucky. Neller was promoted to major in 1986 and was posted at Marine Corps headquarters. In 1988 he was made commanding officer of the Marine Corps security company in Panama and participated in Operation Just Cause, the removal of Panamanian President Manuel Noriega. In 1990, Neller attended the Marine Command and Staff College then was sent back to the First Marine Division as commanding officer of the 3rd Light Armored Infantry Battalion. He was promoted to lieutenant colonel in August 1992 and deployed with his unit to Somalia from December 1992 to February 1993 as part of Operation Restore Hope, the effort to restore order enough to allow humanitarian aid to be distributed. He was then sent to Twentynine Palms, California, as executive officer of the Seventh Marines before going to Europe for three years on the staff of Supreme Headquarters, Allied Powers Europe. Neller was deployed to Bosnia-Herzegovina to help enforce the peace agreement there. Neller returned to the United States in 1997, was made colonel and was assigned to the 2nd Marine Expeditionary Force at Camp Lejeune, North Carolina. In 1998, he became commander of the Sixth Marine Regiment. In March 2001, Neller got his star as brigadier general and subsequently was named assistant division commander of the 2nd Marine Division. In 2002, he was assigned to Marine Corps headquarters as director, Operations Division, Plans and Policies. He returned to Camp Pendleton in 2005 as Deputy Commanding General of the First Marine Expeditionary Force, which was deployed to Iraq in 2006. Back in the U.S. the following year, he was made major general and served as Assistant Division Commander for the 1st Marine Division. He took command of the 3rd Marine Division in June 2007. In 2009, Neller was made president of the Marine Corps University, which coordinates education for officers and enlisted personnel. He became Director of Operations for the Joint Staff in 2011 and the following year was made commander of the Marine Corps Forces Central Command based at MacDill Air Force Base near Tampa, Florida. In 2014 he was made commander of the Marine Corps Forces Command in Norfolk, Virginia. Secretary of Defense Ashton Carter nominated Neller for the commandant post on July 2, 2015, over several other higher-ranked officers. However, Neller and Carter were known to have had a good relationship since Neller’s stint on the Joint Staff. Neller is also said to be attentive to the needs of the average Marine. He has launched a campaign to cut down on drunk-driving accidents and deaths involving Marines. High school sweethearts Neller and his wife, the former D’Arcy Dutch, have three children: Brett, Claire and Kurt.